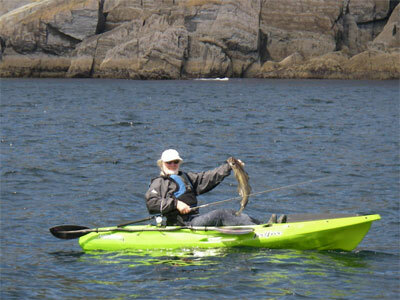 The Moken 10 Angler is a fishing kayak with extreme stability. A great choice for the larger paddler with stability and comfort in mind. Looking for a compact fishing kayak with extreme stability? Look no further than the Moken 10 Angler from Feelfree. Designed similarly to the smaller Moken 10 Lite, the 10 Angler has a trimaran style hull, which provides exceptional stability in a range of different conditions. The hull design also has a defined keel, giving it great straight line tracking for a 10 foot sit on top without compromising on it's maneuverability. The Moken 10 Angler is an ideal choice for those looking for a smaller length, stable fishing kayak or larger paddlers that want to be comfortable when out on the water. The Feelfree Moken 10 Angler comes we equipped as standard with 4 flush mounted rod holders, centre storage console and 8" round hatch, as well as a large wet/dry bow storage well with hard top cover. This works well for extra storage space for the essentials or a great live well to keep your catch! The 10 Angler also has a large rear tankwell again for extra storage or the perfect place for a crate with all of your fishing gear. Moulded-in carry handles all around make moving the Moken 10 an easy task both on and off the water. The Wheel-In-The-Keel also makes transporting the Moken 10 that much easier. The Moken 10 Angler is available in a range of different colour options and can be supplied with a variety of different seats and paddles dependent on your requirements and budget. Add any Feelfree sit on top kayak seat (sold separately) to the Feelfree Moken 10 Angler to give maximum comfort for those long days on the water. One of the most popular seats for this style of kayak is the Feelfree Kingfisher Seat.